Calgary's mayor said Monday that he never asked the provincial government to chip in $1 billion toward the 2026 Winter Olympics. The province's $700-million Olympic funding announcement Friday has been seen by some members of council as being below what they were expecting. With that number, the city would have to contribute $800 million in order to get that maximum level federal support and hit the $3-billion figure in public money required. 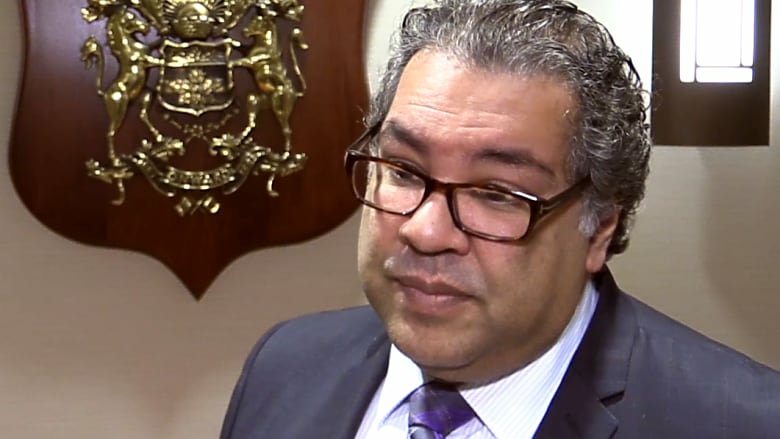 Mayor Naheed Nenshi is countering that perspective, saying the provincial support, "is well within the range of numbers that have been looked at." "I also read that someone had asked the province for a billion dollars. I didn't ask them for a billion dollars, so I don't know where that actually comes from," said Nenshi. The federal government has pledged to match the combined provincial and municipal contributions up to the 50 per cent of the total public investment that's required for the Calgary bid plan. Calgary 2026 estimates $3 billion in public money is needed. By that measure, the federal contribution would have been a maximum of $1.5 billion. Nenshi told reporters that he thinks the city finding $800 million "is a bit too high." The mayor has said if the city can assemble what he calls a good deal for Calgary, he would campaign in favour of supporting an Olympic bid. When reminded of that commitment and asked if $800 million is a potential good deal, Nenshi answered by saying "I think if you're looking at the city putting in $800 million — more than the province — that is not a good deal." Olympic opponent Coun. Sean Chu said the provincial commitment is short of what the city was expecting. In fact, it's so short that he feels the bid is in peril. "I would like to think it's dead," said Chu, but added that Calgarians will have the final say in the Nov. 13 plebiscite on the bid. Nenshi said he expects the federal government will announce its financial contribution sometime in the next week. Once that happens, the extent of the city contribution will be known. There are three potential layers of municipal costs should Calgary win an Olympic bid. There's the money needed for the Olympic hosting plan. That plan could result in Olympics-related costs. For example, the draft hosting plan calls for the potential removal of a Calgary Transit bus storage facility in Victoria Park to make way for an athletes' village. The city would have to pay for the construction of a new facility. A council document leaked to the CBC also said there would be discretionary Olympics costs which could result from council decisions for additional infrastructure. No specific examples were provided in that document. If Calgarians vote in favour of the bid in next month's plebiscite, Calgary 2026 will submit a bid book to the International Olympic Committee in January. The IOC is expected to name the host city for the 2026 Games in June next year.